Hey beautiful people. 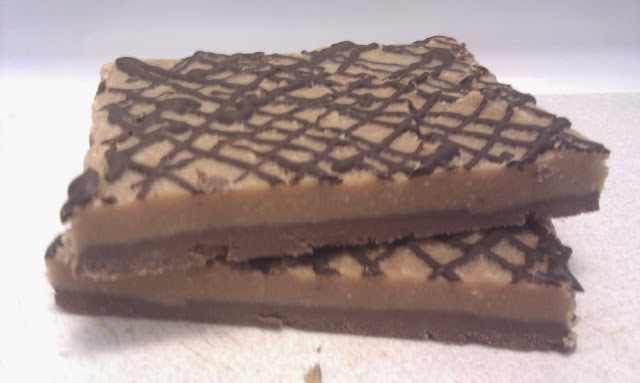 Someone in ##loseit suggested demanded that I make layered fudge. So I bring you chocolate-peanut butter fudge. This should be it for fudge for a few weeks, too. There are other flavours I'd like to try my hand at eventually, though. 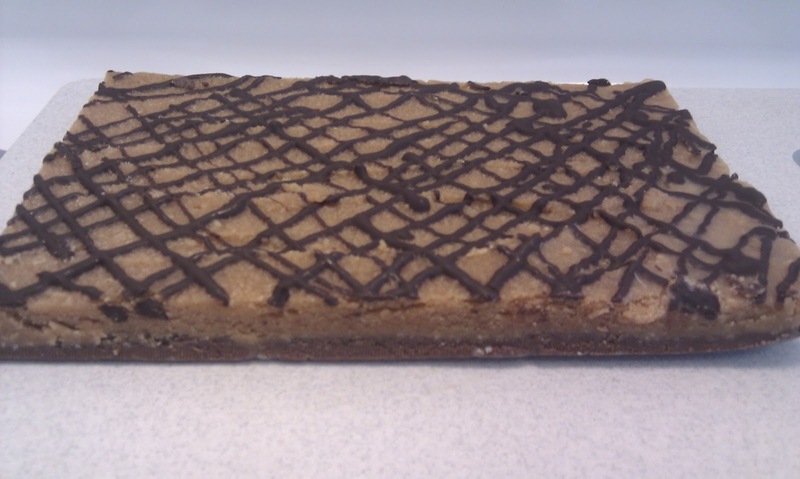 a delicious slab of layered chocolate and peanut butter fudge. 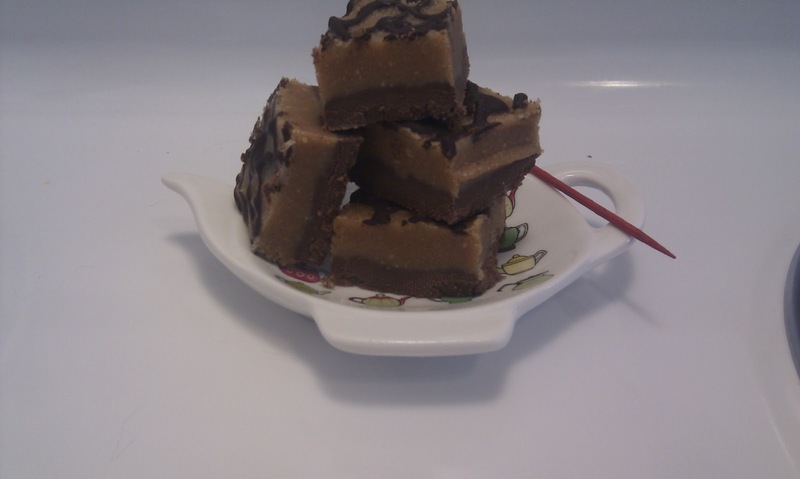 **When I made the peanut butter fudge for this layered fudge batch I only used 1 scoop of protein powder. The peanut butter fudge I posted a couple weeks ago used 2 scoops. Either will be fine. Nutritional values reflect ingredients actually listed. As with the other batches of fudge, I'm lazy so I will copy and paste most of the directions. Start with the chocolate fudge! Lightly grease whatever small baking dish you picked out. Or line it with parchment paper. Or both. I am going to go ahead and recommend that you use parchment paper. That way, the slab can be easily lifted from the dish. Cut your 1/2 stick of butter into smaller chunks or slices for easy melting. Put your saucepan on low-medium heat and begin melting the butter. Note: less heat is better. If you cook the fudge for too long, or on too high of a heat, the butter eventually cooks out of whatever you are trying to mix it with. You'll know this is happening when the chocolate pools in the middle of the pan, surrounded by a ring of butter. Make sure to stir often. Add the softened cream cheese to the butter mixture, stirring until all the cheese is melted. Once that is blended, add your sweetener and stir (again, I used 1/2 cup of Splenda). Next, add the protein powder and cocoa powder gradually as you stir. Finally, once all ingredients have blended together, pour the 'batter' into your prepared dish. Put the chocolate fudge in the fridge and move on to the peanut butter portion! Cut your 1/2 stick of butter into smaller chunks or slices for easy melting. Put your saucepan on low-medium heat and begin melting the butter. While the butter is melting go ahead and add a cup of peanut butter. Stir these two ingredients together while melting. Add your cream cheese to the melty pot and stir until melted. Add whatever sweetener you decided to use. I'll dump 1/2 cup of Splenda in there. Next, gradually add the whey powder. Pour your peanut butter fudge 'batter' on top of the chocolate fudge you made a few minutes ago. Put your dark chocolate in a freezer baggie and microwave it for ~15 seconds. Snip a tiny hole in the corner of the bottom of the bag. Drizzle the melted chocolate over top of the peanut butter. Refrigerate your fudge for 2 or more hours, then enjoy. Store the fudge in the fridge.